If you picture your perfect honeymoon surrounded by the glistening and pristine Aegean Sea, Greece has everything to offer you and more. If you picture your perfect honeymoon surrounded by the glistening and pristine Aegean Sea, Greece has everything to offer you and more. 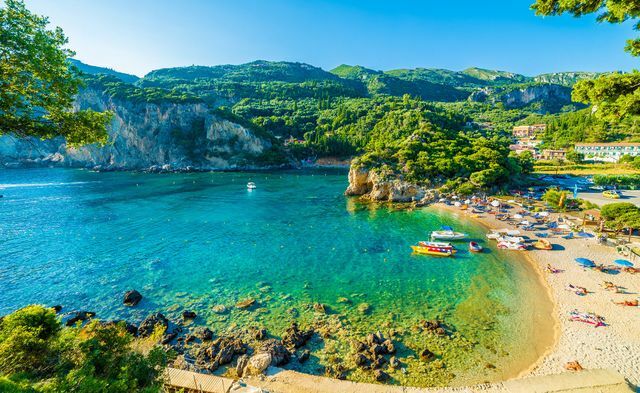 The biggest decision, perhaps, when it comes to a Greece honeymoon, is choosing between the mainland, or in other words Athens, or the myriad of island that scatter across the Mediterranean. 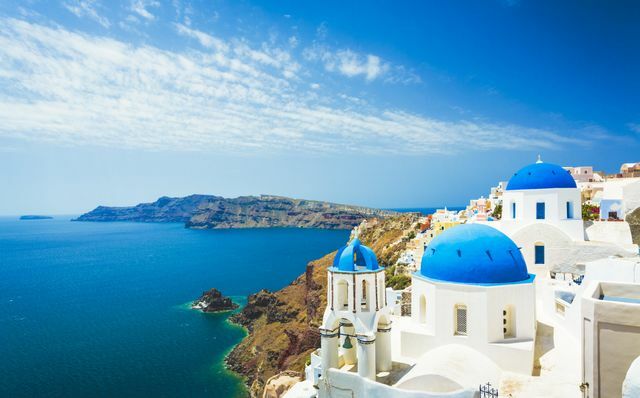 While there are a whopping 6,000 to be exact, only about 227 are inhabited and only a handful make the list of best honeymoon destinations, namely, Santorini, which has received the title of “most romantic honeymoon destination” for decades. Ready to do a little digging to find out if a Greece honeymoon is right for you and your soon-to-be spouse? Here’s everything you need to know. Like most European countries, Greece experiences its height of tourism from May to October when the weather is warm and sunny. While this might be the most pleasant time to visit, in terms of the outdoor temperature, the most ideal time of year for honeymooners is undoubtedly fall (September-November), when the weather is still relatively warm, but the crowds have come and gone. If you’re honeymooning in the winter, make Santorini and Crete your top destinations, since business tends to never come to a close the way it does in other islands such as Mykonos and Naxos. Most flights from anywhere in the world fly directly to Athens, the capital and most notably historic city in all of Greece. It’s history spans more than 3,400 years and it’s one of the earliest cities known to be inhabited by humans. Pretty cool, right? Since you’ll likely be flying into Athens anyways, you might as well take a few days to explore the sights. Your first stop should be the Acropolis Museum in the Makrigiani district, which is most central to the city. This ancient citadel is the location of the remnants of several ancient buildings, the most famous being the Parthenon. Other sights to lock in while you’re enjoying a Greece honeymoon in Athens include Plaka, a historical neighborhood located just under the Acropolis that is now home to hundreds of residents. Also located within the complex of the Acropolis is Erechtheion, a worship spot constructed between 421 and 406 B.C. 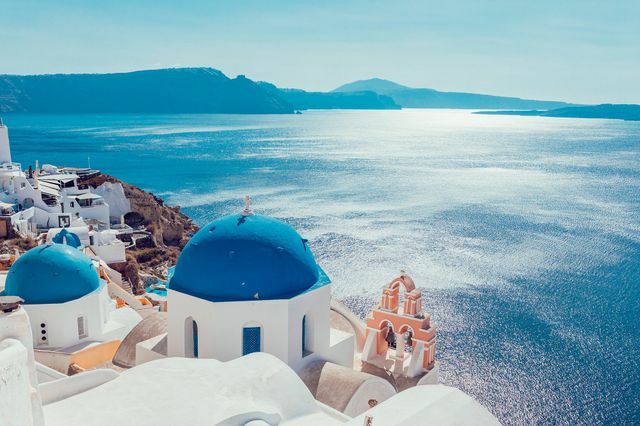 Without a doubt Greece’s most stunning island known for its sunsets, beaches, shopping and fresh seafood, Santorini is a must-see for your Greece honeymoon. You and your special someone will have an unlimited array of activities at your fingertips, from beach hopping (don’t miss Karamri, Perissa, Perivolos and Red Beach! ), cave swimming, catamaraning and snorkeling to hiking the 6-mile “Fira to Oia Hike” that offers breathtaking views of the caldera, touring the handful of Santorini wineries and visiting ancient sites like Akrotiri and Thera, you will feel immensely cultured and nourished upon your visit to this spectacular Greek island. Party-loving bride and grooms, this Greek island is calling your name. Perhaps the most club-centric island in Europe next to Spain’s Ibiza, Mykonos has a reputation for a good time. But even if you’re not a partier, this stunning Greek island has much to offer honeymooners. You’ll definitely want to make a visit to Little Venice, a tiny neighborhood that overlooks the southwest harbor of the island. This is the location where early ship captains used to dock and load and unload goods. Now it is home to some of the cutest (and most expensive!) shops, cozy bars and restaurants and, of course, nightclubs. 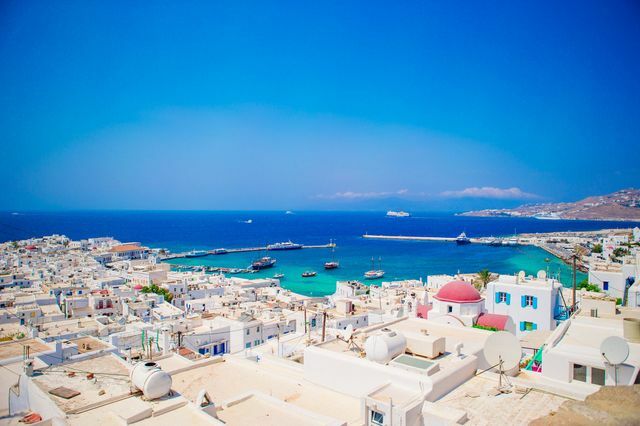 Don’t be alarmed by the amount of adorable and friendly cats you see roaming around everywhere—Mykonos is also called “Cat Island” and is home to thousands of meowing sweethearts who will sit and pur in your lap if you let them! Has anyone gone to Greece for vacation or honeymoon? I am trying to find recommendations of islands we should go to and places we should stay! Greece honeymoon — on your own or tour guide?